Because the number of homes closed was up, and prices were up, naturally too was the total volume of sales. Total volume this April was $545 Million, up from $410 Million last year. That’s a 32.9% increase. We’ve mentioned in previous articles that top agents across SW Florida are reporting an increase in their business this season over last. So, does this mean the market is shooting up? If you read the headlines, you would think so. Pockets of the market are doing well and other pockets not so much. We believe May numbers could be good too when they are released next month, only because our numbers are better than last years. That doesn’t mean a good April and May will translate to the whole year, nor to every neighborhood and price range. One thing the latest numbers show us is new listings are up 19.8%. Inventory is up 5.1%. This is one of the reasons you’re seeing more sales, because we finally have more property available for buyers. The hottest segment of the market is below $400,000, and some would say lower than that. 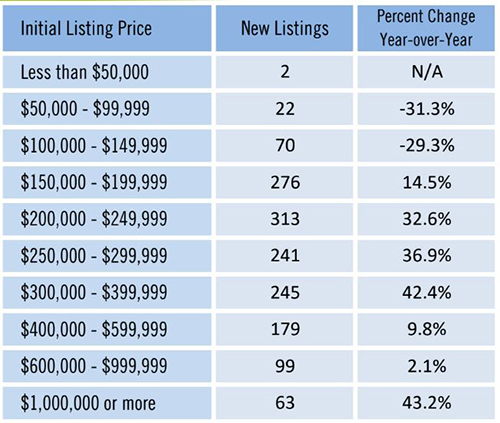 If you look at the chart, we’ve seen a tremendous increase of new listings in that affordable range. When that happens, sales increase. Homes priced over $400k are just not as hot right now. Sure, we had some April sales because it was season. Those closed sales occurred in February and March. Since then we’re not seeing as many. We are seeing sales across all prices ranges for homes that are priced correctly. Because the market is shifting right now, it’s sometimes hard to get a fix on what is priced correctly and what isn’t. Showings in May are down. And yet, many homes are still selling. If your home is getting lots of showings, it’s probably priced close to the market. If not, you’re probably priced over the market. Last week I went out to preview new builder inventory. As a Realtor we see the incentives the public doesn’t always see. Home builders want to get as much money as they can for their homes. However, home builders are less emotional and react quicker to market changes than regular sellers. Home builders are not emotional like a home seller is. They have no ties to the property. It’s just a number to them. Granted, they want that number to be the highest it can be. I was amazed at some of the prices I saw. Builders are not lowering because they’re kind. They’re lowering because they are seeing changes. New construction pricing and incentives affects resale pricing. Sellers need to know that buyers don’t just look at one home. They look at 20 or more, and online sometimes it’s hundreds. They learn the market. They’re using sites like www.LeeCountyOnline.com and seeing all the listings in real-time. Fairly quickly they can see what’s going on and make decisions. Sellers tend to set a price and forget about it. They get mad at their Realtor, mad at their neighbor who just reduced their price, and mad at the market when it doesn’t sell. Instead of getting mad, we’d like to see you have success. When your price matches the market, it will sell, assuming it’s marketed correctly. If you’re looking to sell your home, please call Sande or Brett Ellis 239-489-4042 Ext 4. We can help you purchase too. And don’t forget to vote for us as best real estate team in SW Florida. We’re going for a 3 peat and could use your vote. Posted in Cape Coral, Cape Coral Real Estate, Fort Myers Beach, Fort Myers Real Estate, Reflection Lakes, Southwest Florida Real Estate.Tagged real estate bargains, Southwest Florida Real Estate Sales.